Seebeck Effect thermoelectric power modules are design with high temperature bonding materials that allow them to withstand temperatures of up to 320°C (608°F). As long as the module is placed into a system, whereby the hot side has a higher temperature than the cold side, DC power will be produced. 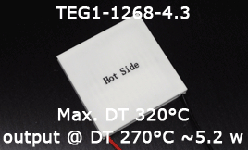 The greater the DT (difference in temperature across the module the greater the power produced). These modules can be placed in parallel and series to produce a workable larger voltage. Each module is built with high temperature graphite sheets on both the hot & cold side, eliminating the need for thermal grease. The leads are connected to the cold side on the module in order to protect them from extreme temperatures.